Every business should seek to make their customers feel welcome. A simple welcome flag, which invites customers to enter your establishment helps to ensure that they feel comfortable. Our team of experts have designed a range of welcome Swooper Flags to do exactly this, ranging from vibrant eye-catching styles to iconic patriotic designs. These flags are ideal for any business who wants to maintain a great relationship with their customers. 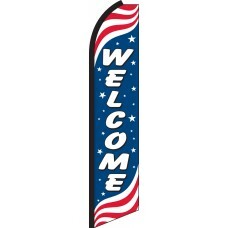 Some of our most popular Welcome Swooper Flags include our patriotic designs, which are especially popular during national holidays like Independence Day and Memorial Day. Our Spanish language option, which can be used in areas with large Spanish speaking populations; and our simpler designs, which use eye-catching colors to welcome everyone. 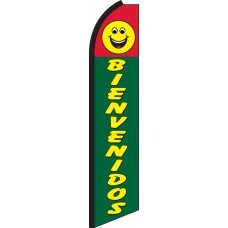 Many of the flags in our welcome range can also be used in conjunction with other flags that we provide. For example. you could use the patriotic welcome flag, along with the patriotic sale flag, to create a vibrant display, which really makes your business stand out from the crowd. 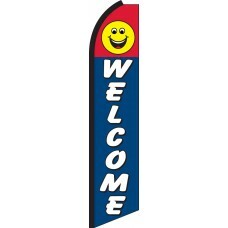 Check out are great range of Swooper Welcome Flags below!